Kevin Barton was diagnosed shortly after birth with a form of Muscular Dystrophy called, Spinal Muscular Atrophy. It is a genetic disease that affects the motor nerve cells in the spinal cord and causes progressive weakness of the muscles. When his friend, Ryan, learned that Kevin was struggling to cover health care expenses, he decided to earn donations for Kevin by doing when of his favorite activities - riding his bike! My Cause & Connection: I’m earning it to help out my dear friend, Kevin with healthcare expenses related to muscular dystrophy. My Competition: I earned it by biking over 140 miles. My Contribution (results): I raised more the $1,ooo and created awareness in my community. Inspirational Quote: I'm just a Nashville songwriter, nothing close to an athlete, just riding my bike dedicated to an important cause in my friend Kevin. If I can do it, you can too! Peddlin' 4 Kevin was Ryan Bizarri first fundraising campaign. Ryan ended up earning more than $1,000 for his friend Kevin by biking 140 miles. Our team conducted an interview with Ryan to learn more about his fundraising efforts, and why he decided to earn donations for his friend. What inspired you to first get really involved in your cause? Kevin Barton, whom I am riding for, is a dear friend, sweet co-writer and a super inspiring soul. Kevin asked for contributions to help his cause in the fall but I wasn't able to contribute at that time. I am Catholic and when Lent came around, I felt a calling to not only donate to Kevin's Freedom Fund but to try to reignite his cause and make people aware that Kevin is still in need. Because Kevin has Muscular Dystrophy and unable to move from the neck down (mostly) he rides in a chair. It only made sense for me to get on my bike and roll with it as well. Why did you choose a performance-based fundraiser? What was appealing about performance-based fundraising? I chose Pledge It because Pledge It allowed me to show people that I was committed to Kevin's cause by sacrificing my own time, money and resources by biking every chance I could between Ash Wednesday and Good Friday. PledgeIt gave me a platform to demonstrate the importance and my commitment to the cause, which in turn, helps potential pledgers connect to the message and ultimately donate to the cause. I chose Pledge It because the fundraising website allowed me to post the mileage ridden per day so my progress would be clear to me and the pledgers so they could not only get a good feel for what they could donate but follow along as the campaign unfolded. Pledge It also allowed flat donations as well for pledgers who may not have wanted to be surprised by the results or had a limited budget. What has it been like to know that the money being raised is based on your performance? I believe that because Peddlin' 4 Kevin was a performance based campaign, it added a deeper level awareness and understanding for the cause. I was able to show people that I was committed to Kevin's cause by sacrificing my own time, money and resources by biking every chance I could between Ash Wednesday and Good Friday. I was able to communicate the importance and my commitment to the cause, which in turn, helps potential pledgers understand and ultimately connect to the message. What advice do you have for someone who wants to start raising money for their cause? 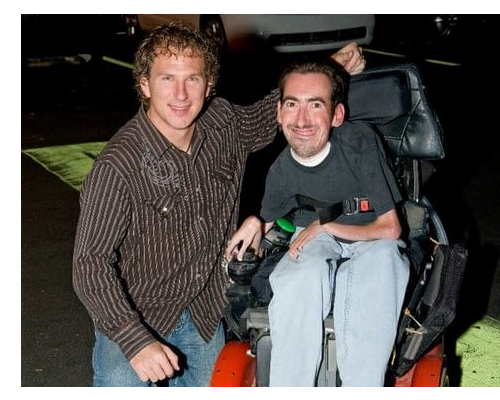 When people hear about Peddlin' 4 Kevin, I hope they are inspired to simply give of themselves to someone else in whatever capacity they can! Giving doesn't always have to be with money! If you want to do something special for someone, start with your talents or hobbies and spin it in a way that works! I'm just a Nashville songwriter, nothing close to an athlete, just riding my bike dedicated to an important cause in my friend Kevin. If I can do it, you can too! What do you hope that people remember when they see your story/campaign? This campaign was also meant to inspire. It inspired me because I saw the whole thing transform from an idea in my head to money to a worthy cause. I felt good to do good for a friend. We blasted this on social media for nearly 40 days so it blew me away to hear and read the kind words, compliments and most importantly pledges from kind and giving hearts. My advice for someone who wants to do the same sort of thing is to just go for it! It's super rewarding! At Pledge It, we believe support for a cause is earned, not given. Our community of everyday athletes are inspired to earn the change they want to see in the world! Join the movement at pledgeit.org.